The Ceratonia Siliqua tree, often referred to as the carob tree, is a plant species native to the Mediterranean region that comes from the pea family. This resemblance becomes apparent when you look at the pea-like pods it produces, which are called carob pods. What are carob pods used for? The brown pods from carob trees, when ripe, can be harvested, dried and ground into powder. The powder has a miraculously sweet and mild flavor and is very similar to the powder made from cacao plants, the foundation for chocolate. Carob is a wonderful ingredient for promoting intestinal health by combatting bacterial overgrowth in the GI tract. Carob is also a great digestive regulator with its fiber content, helping to enhance optimum peristalsis, which is the movement of digestive contents through the digestive tract. Many of its health benefits come from its high vitamin and mineral content, including calcium, zinc, potassium, phosphorous, vitamin K, riboflavin, and vitamin E, as well as its natural antioxidants. While carob and chocolate have similar flavor and applications, carob is almost universally a better option. Pure carob contains no caffeine, while a tablespoon of cocoa powder has 12mg. This is a huge benefit for people sensitive to caffeine or for children. The difference is that carob has a more natural sweetness, meaning you usually need less of it in similar recipes. Carob also has more fiber than cacao, something many people are deficient in. While both carob and chocolate are neutral for all blood types, carob is beneficial for Type O’s. How Has Dr. D’Adamo Utilized Carob? One of the only downsides of pure carob is that while it eclipses the sweetness of chocolate, it lacks the richness. To make this healthy ingredient as decadent and delicious as possible, Dr. Peter D’Adamo created Carob Extract, a mixture that includes Carob Extract as its first ingredient and then a subtle hint of agave syrup and dutched cocoa powder to round out and enrich the flavor. The end result is a chocolate-syrup like substance with all the crowd-pleasing flavor and health benefits to boot. It only contains 1.4mg of caffeine per teaspoon from the included cocoa powder (compared to 95mg in an 8oz cup of coffee) and 11 calories. One teaspoon is usually more than enough to give you the decadent flavor you are looking for. What are the best uses for Dr. D’Adamo’s Carob Extract? Carob Extract is the perfect beverage additive for kids who are picky eaters or for individuals who need extra nutritional support but have problems swallowing pills and capsules. It is delicious in a milk right for your blood type or even hot water as a healthier hot chocolate. Dr. D’Adamo’s Carob Extract also goes great on most things that could use a sweet, chocolatey drizzle, such as pancakes, ice cream, fruit or crepes. Kids (and adults!) love a comforting cup of hot cocoa! 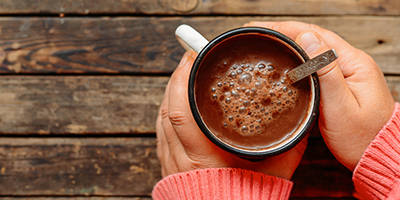 Instead of the processed powdered hot chocolate mix, try our healthier version. 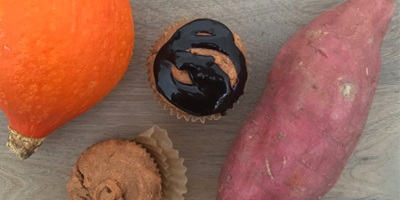 These muffins, from our Personalized Cookbooks, made with sweet potato or pumpkin based on blood type, compliment the chocolate flavor of carob perfectly. 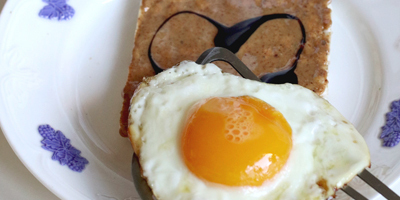 The Eat Right Chef "Egg-wich"
This "Egg-wich" with almond butter and rice cakes was made by our friend the Eat Right Chef and makes for a great breakfast.